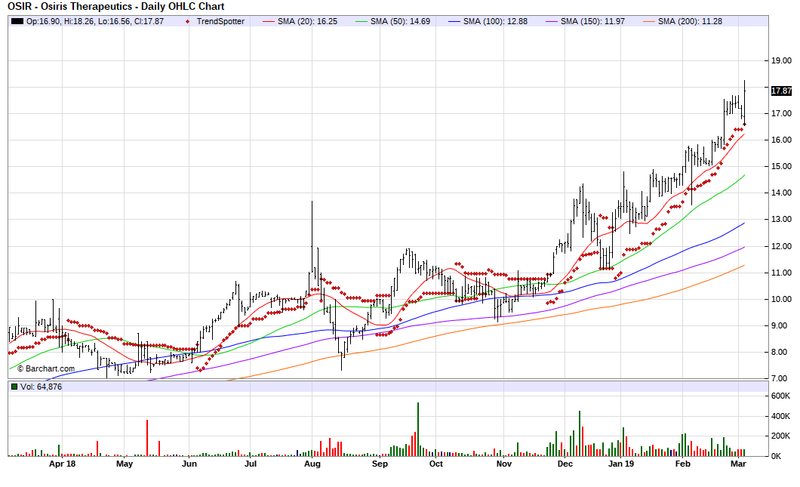 The Barchart Chart of the Day belongs to the stem cell therapeutics company Osiris Therapeutics (OSIR). I found the stock by sorting Barchart's Top Stock to Own list first by the highest Weighted Alpha, then I used the Flipchart function to review the charts for consistent price appreciation. Since the Trend Spotter signaled a buy in 12/28 the stock gained 36.93%. Osiris Therapeutics is a leading stem cell therapeutic company focused on developing and marketing products to treat medical conditions in the inflammatory, orthopedic and cardiovascular areas. Osiris currently markets and sells Osteocel for regenerating bone in orthopedic indications. Prochymal is being evaluated in Phase III clinical trials for three indications, including acute and steroid refractory Graft versus Host Disease and also Crohn's disease, and is the only stem cell therapeutic currently designated by FDA as both an Orphan Drug and Fast Track product. Osiris also has partnered with Genzyme Corporation to develop Prochymal as a medical countermeasure to nuclear terrorism and other radiological emergencies. Osiris is a fully integrated company, having developed capabilities in research, development, manufacturing, marketing and distribution of stem cell products.